I’ve pointed each element of this recipe so that you can pick and choose which parts you want to include or replace with another. I had 80g cooked pulled pork (3sp) with 2sp worth of BBQ sauce, 1sp worth of spicy slaw, a Warbie Thin (3sp) and 150g potato wedges (3pp) for a total of 12sp. This sauce is only 2sp per person when serving 6 people. In the bottom of a roasting tin, scatter the onions, garlic and bay leaves. In a bowl mix together the rest of the spices with the salt and pepper. Pat the meat dry and then rub the spices into the meat getting into all the nooks and crannys. Place the meat on top of the onions, pour the stock around it and then pop a lid (or tin foil) on the roasting tin and pop in the oven for around 4 hours until falling apart. Lift the pork out the pan and pop to one side to rest for around 15 mins (while you make the sauce). In a sauce pan pop the onions and bay leaves (out of the roasting tin) with all the other sauce ingredients. Discard the garlic. Simmer for five minutes until the sauce thickens and then take off the heat. Remove all of the fat from the pork and discard (unless you have a none dieter in your house who insists on eating the cracking!). Using two forks shred the meat until you have a nice big pile of gorgeous meat. Take 320g (enough for 4 people, 80g per person if less) of the meat from the pile and pop into the BBQ sauce mixture, combining well. To make the slaw mix the mayonnaise, sour cream, chipotle and lime in a small bowl. In a large bowl pop all the veg with the white wine vinegar. Toss and then add the mayonnaise sauce, mixing so it is evenly distributed. 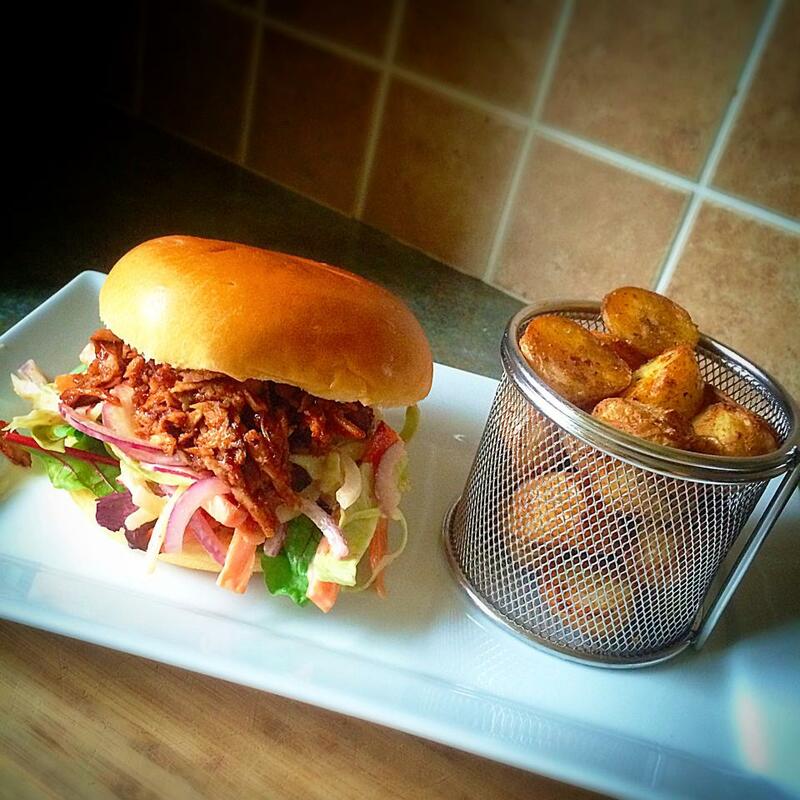 To serve pop some salad leaves on the bottom of your bun, top with slaw then the pulled pork and then top with the bun. Serve with the smoky potato wedges and enjoy! If you prefer to slow cook begin by scatter the onions, garlic and bay leaves in the bottom of a slow cooker. In a bowl mix together the rest of the spices with the salt and pepper. Pat the meat dry and then rub the spices into the meat getting into all the nooks and crannys. Place the meat on top of the onions, pour the stock around the meat and cook for 8-12 hours on MEDIUM. Follow the rest of the recipe as above. Sounds amazing. Do you think it would freeze ok? I made this for the whole family at the weekend and everyone loved it! It was delicious and the flavours were beautiful. No-one could believe this was within Weight Watchers points. Got a list of other recipes from the website to try….